Ovarian cancer is the fifth most common cancer among women and causes more deaths than any other type of female reproductive cancer. Currently, treatment of ovarian cancer is based on the combination of surgery and chemotherapy. While recurrent ovarian cancer responds to additional chemotherapy treatments, the progression-free interval becomes shorter after each cycle, as chemo-resistance increases until the disease becomes incurable. There is, therefore, a strong need for prognostic and predictive markers to help optimize and personalize treatment in order to improve the outcome of ovarian cancer. An increasing number of studies indicate an essential role for microRNAs in ovarian cancer progression and chemo-resistance. MicroRNAs (miRNAs) are small endogenous non-coding RNAs (~22bp) which are frequently dysregulated in cancer. Typically, miRNAs are involved in crucial biological processes, including development, differentiation, apoptosis and proliferation. Two families of miRNAs, miR-200 and let-7, are frequently dysregulated in ovarian cancer and have been associated with poor prognosis. Both have been implicated in the regulation of epithelial-to-mesenchymal transition, a cellular transition associated with tumor aggressiveness, tumor invasion and chemo-resistance. Moreover, miRNAs also have possible implications for improving cancer diagnosis; for example miR-200 family, let-7 family, miR-21 and miR-214 may be useful in diagnostic tests to help detect ovarian cancer at an early stage. Additionally, the use of multiple target O-modified antagomirs (MTG-AMO) to inhibit oncogenic miRNAs and miRNA replacement therapy for tumor suppressor miRNAs are essential tools for miRNA based cancer therapeutics. In this review we describe the current status of the role miRNAs play in ovarian cancer and focus on the possibilities of microRNA-based therapies and the use of microRNAs as diagnostic tools. Epithelial ovarian cancer (referred to as ovarian cancer in this review) is the fifth most common cancer among women and causes more deaths than any other type of female reproductive cancer . Signs and symptoms of ovarian cancer are frequently absent or ambiguous early on and due to a lack of early detection strategies most (>60%) patients are diagnosed with advanced-stage disease. The five year survival rate is less than 30% for these advanced-stage patients and, despite advances in chemotherapy, survival rates have only modestly improved over the past 40 years [1–3]. Pathologically, ovarian cancer is a heterogeneous disease comprised of serous, mucinous, clear cell, and endometrioid subtypes. Serous tumors are the most common subtype. Each subtype is associated with diverse genetic risk factors and molecular events during oncogenesis and is characterized by distinct mRNA expression profiles. It has been observed that subtypes respond differently to chemotherapy. The response rate of clear cell carcinomas (15%) is very low, whereas the response rate for high-grade serous is 80%, resulting in a lower 5-year survival for clear cell compared with high-grade serous carcinoma in patients with advanced stage tumors (20% versus 30%) [4, 5]. The standard treatment for advanced ovarian cancer is surgical tumor debulking (removal of all tumor and metastasis that can be macroscopically detected in the entire abdomen region), followed by platinum-based chemotherapy . Neoadjuvant therapy, the use of chemotherapy or radiation prior to surgery, may be an option for patients with stage IIIC or IV ovarian cancer which typically presents with a large tumor burden and extensive metastases. For these patients optimal debulking may be difficult to achieve, making neoadjuvant therapy an important option ; however, there is currently an ongoing debate to clearly identify which patients would benefit from neoadjuvant therapy [8, 9]. Chemotherapy in ovarian cancer includes platinum-based drugs, cisplatin or carboplatin coupled with paclitaxel. After first-line treatment with carboplatin and paclitaxel, most patients eventually relapse with a median progression-free survival of 18 months. Recurrent ovarian cancer initially responds to additional chemotherapy; however, the progression-free interval becomes shorter after each cycle as chemo-resistance increases until the disease becomes incurable . A number of molecular mechanisms have been characterized to explain the development of resistance to chemotherapy, such as increased DNA repair activity and defective DNA damage response , increased anti-apoptotic regulator activity [12, 13], growth factor receptor deregulation   and post-translational modification or aberrant expression of β-tubulin and other microtubule regulatory proteins . The recently discovered microRNAs (miRNAs) constitute a novel regulatory layer of gene expression and have been implicated in the etiology of various kinds of human cancers. miRNAs are small (~22bp) endogenous non-coding RNAs and are frequently dysregulated in cancer. Their role is to modulate gene expression mainly by base-pairing to the 3’-UTR (untranslated region) of the target mRNA, eventually causing either translational repression, mRNA cleavage, or destabilization . In ovarian carcinoma the expression of various miRNAs has been found to be dysregulated . Recent reports support a role for miRNAs in the initiation and progression of ovarian carcinoma [19–21] by promoting the expression of proto-oncogenes or by inhibiting the expression of tumor suppressor genes. In this review we focus on the current status of the role miRNAs play in ovarian cancer (Figure-1 and Table-1). We also describe their diagnostic / prognostic and therapeutic potential. 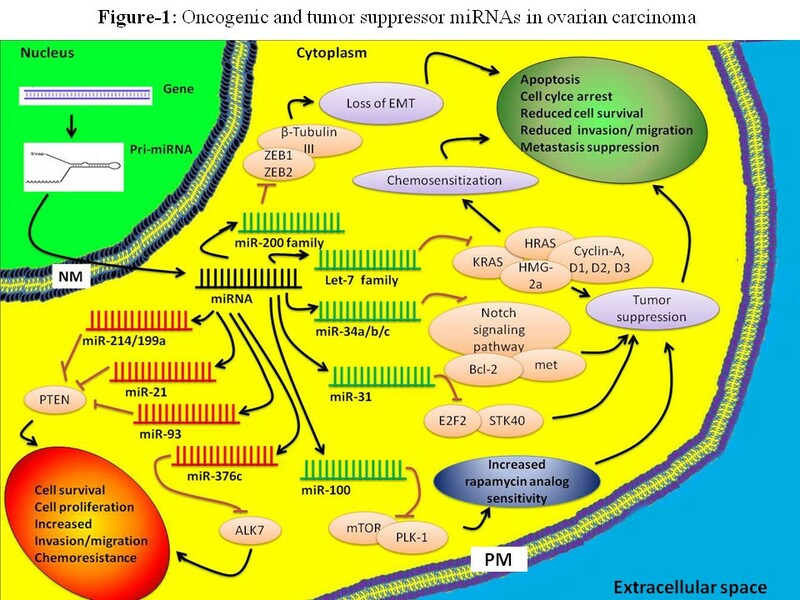 Oncogenic and tumor suppressor miRNAs in ovarian carcinoma. Based on their function miRNAs can be used for diagnostics and therapeutics. Certain miRNAs such as miR-200 family, let-7 family, miR-21, miR-214 and miR-100 have strong diagnostic/prognostic potential in ovarian cancer. Use of antagonists for oncogenic microRNAs and microRNA replacement therapy for tumor suppressor miRNAs are important tools in miRNA based cancer treatment. EMT-Epithelial to Mesenchymal Transition; NM-Nuclear membrane; PM-Plasma membrane. miRNAs in ovarian carcinoma can either be oncogenic or tumor suppressor. Tumor suppressor miRNAs suppress oncogenes resulting in either loss of EMT (Epithelial Mesenchymal Transition), chemosensitization or tumor suppression. Whereas, oncogenic miRNAs target tumor suppressor genes leading to chemo resistance and reduced survival. miRNAs were first discovered in 1993 by Lee, Feinbaum and Ambros in the nematode C. elegans  and are now known to be present and highly conserved among a wide range of species . Mature miRNAs are derived from precursors called pri-miRNAs, composed of hundreds or thousands of nucleotides [17, 24, 25]. miRNAs precursor sequences are located in different parts of nuclear DNA and may constitute mono- or policistrone transcriptional units. Pri-miRNAs are transcribed mainly by polymerase RNA II. Subsequently, they are cleaved by the endonuclease Drosha and cofactor DGCR8 into a structure known as precursor miRNA or pre-miRNA. Pre-miRNAs, ~60 nucleotide stem-loop molecules, are transported from the nucleus to the cytoplasm by Exportin 5 and protein Ran-GTP and further processed by the Dicer enzyme into a ~22 nucleotide double-stranded microRNA . The double-stranded miRNA assembles into a ribonucleoprotein complex which is known as the RNA induced silencing complex (RISC) . The RISC induces unwinding of the double-stranded molecule into single stranded miRNA, concomitantly degrading the complementary strand. In animals the miRNA–RISC binds to 3’ untranslated region (3’ UTR) of mRNA, does not require perfect complementarity, and induces inhibition of translation at the initiation or elongation phase . The mode of inhibition may depend, in part, on the level of complementarity of the miRNAs where perfect or near perfect complementarity favors degradation. The mechanism of 3’UTR mRNA target regulation is complex. Nevertheless, recent studies suggest that it is a two step process in which inhibition of translation is done first, followed by mRNA decay due to deadenylation of the mRNA . The seed sequence is essential for the binding of the miRNA to the mRNA. The seed sequence is a conserved heptamerical sequence which is mostly situated at positions 2–7 from the 5’ end of the miRNA, although other factors are also important [17, 29]. Gu et. al. have suggested that miRNA target sites can also be found in the 5’ UTR or even in the coding region of the mRNA. By binding to 5’ UTR sequences miRNAs can also activate translation. Thus, inhibition of posttranscriptional mRNA processing is not the only way of regulating miRNA-dependent gene expression . Moreover, as miRNAs do not require perfect complementarity for functional interactions with mRNA targets, a single miRNA can regulate multiple targets and conversely, multiple miRNAs are known to regulate individual mRNAs . miRNAs are involved in crucial biological processes, including development, differentiation, apoptosis and proliferation . This is done through imperfect pairing with target messenger RNAs (mRNAs) of protein-coding genes and the transcriptional or post-transcriptional regulation of their expression . The first reported link between miRNAs and cancer regarded chronic lymphocytic leukemia, wherein miR-15 and miR-16 were found to be deleted or down-regulated in a majority of tumors . Since then, changes in the expression level of miRNAs have subsequently been detected in many types of human tumors . miRNAs have various roles in oncogenesis as they can function either as tumor suppressors (e.g., miR-15a and miR-16-1) or oncogenes (e.g., miR-155 or members of the miR-17–92 cluster). Recent studies on the abnormal expression of miRNAs in cancer have described the following reasons for differential expression: chromosomal rearrangements [36–38], genomic copy number change [39, 40], epigenetic modifications [41, 42], defects in miRNA biogenesis pathway , and regulation by transcription factors . One of the seminal studies done on epithelial ovarian cancer (EOC) and miRNA was done by Zhang et. al. in 2008 . In this study the authors utilized an integrative genomic approach to study miRNA deregulation in human epithelial ovarian cancer. They compared mature miRNA expression profiles in 18 ovarian cancer cell lines and 4 immortalized, non neoplastic cell lines derived from normal ovarian surface epithelium. Thirty five miRNAs were found to be differentially expressed between the two groups of cells. Out of these 35, only 4 were up-regulated, whereas the rest were mostly down-regulated in cancer cells as compared to immortalized non-neoplastic cell lines. The 4 up-regulated miRNAs were miR-26b, miR-182, miR-103 and miR-26a. The list of down-regulated miRNAs included prominent tumor suppressors such as let-7d and miR-127. This showed that miRNA expression profiles can distinguish malignant from nonmalignant ovarian surface epithelium. Zhang et. al. went on to analyze 106 primary human ovarian cancer specimens of various stages and grades using miRNA microarrays. They found that all tumor suppressor miRNA alterations were related to down-regulation in late stage tumors, which included miR-15a, miR-34a and miR-34b. The authors also observed that DNA copy number loss and epigenetic silencing are mainly responsible for down-regulation of the miRNAs. In the case of over-expressed miRNAs (oncogenic miRNAs such as miR-182) the chromosomal regions were found to be amplified in a significant number of cancer samples. Additionally, epigenetic alterations reduced the expression of 16 out of 44 miRNAs which were down-regulated in late-stage ovarian cancer as the expression of these miRNAs, e.g. miR-34b, was restored by DNA demethylation or histone deacetylase inhibiting agents. In addition several studies have compared the expression profile of miRNAs in a large number of clinical ovarian cancer samples to normal ovarian tissues, ovarian epithelial cell lines or fallopian tubes [42, 46–51]. The following sections provide information regarding miRNAs that are suggested to be involved in the pathobiology of ovarian cancer (Tables 1 and 2). Most of the miRNA profiling has been done on the serous and clear cell ovarian carcinoma. miR-200 family stands out as the up-regulated miRNA in most types of ovarian cancer. miR-100 plays a specific role in clear cell ovarian carcinoma. The miR-200 family contains miR-200a, miR-200b, miR-200c, miR-141 and miR-429 which are arranged in 2 clusters in the human genome. miR-200a, miR-200b and miR-429 are located on chromosome 1, while miR-200c and miR-141 are on chromosome 12 . Iorio et. al. have shown that the miR-200 family is among the most significantly over-expressed miRNAs in epithelial ovarian cancer. The expression of miR-200a and miR-200c was found to be up-regulated in three types of ovarian cancer: serous, endometrioid and clear cell. However, miR-200b and miR-141 are up-regulated in endometrioid and serous subtypes. The role of the miR-200 family in ovarian carcinoma is complicated. While miR-200 family members are believed to be metastasis suppressants, the majority of studies done on the family relate to over expression in ovarian cancer. However, some studies report that miR-200 family members are either down regulated  or even unchanged . These differing results may occur because of the use of different normal controls or the inclusion of ovarian stromal cells which lack miR−200 expression. Further complicating the potential roles of the miR-200 family members, recent studies have implicated the miR-200 family with the regulation of the epithelial to mesenchymal transition (EMT). EMT is a process where epithelial tumor cells are stimulated by extracellular cytokines, e.g. TGFβ, or intracellular molecules such as oncogenic Ras, to change their epithelial characteristics into a mesenchymal phenotype with increased migratory and invasive capabilities. EMT is induced by a group of transcriptional repressors, such as Snail, Slug, TWIST, Id2, ZEB1 and ZEB2. The protein levels of these repressors increase during EMT, resulting in the down-regulation of genes such as E-cadherin which are responsible for the epithelial identity of the cells . The E-cadherin molecules mediate cell-cell adhesion. Park et. al. have shown a positive correlation in the expression of E-cadherin with the expression of miR-200c in ovarian cancer tissues. The miR-200 family members have also been shown to suppress the expression of ZEB1 and ZEB2, thereby suppressing EMT. Over expression of miR-200 a/b/c and/or miR-141 down regulates ZEB1/2 levels, and leads to higher levels of E-cadherin and an epithelial phenotype. On the contrary, ZEB1/2 can inhibit the expression of miR-200 family members by binding to the promoter of both miR-200 clusters thereby blocking transcription. The mechanistic explanation of the above process can be summarized as follows: activation of a trigger such as TGF-β or PDGF-D , leads to increased levels of ZEB1/2, decreased expression of miR-200 and the induction of EMT [31, 54–57]. The miR-200 family might be down regulated when cancer cells acquire invasive properties and then become up-regulated when the cells undergo mesenchymal to epithelial transition during the process of re-epithelialization, which is evident from the positive correlation of miR-200 and E-cadherin expressions . In a recent study, Leskela et. al. demonstrated the role of the miR-200 family members in controlling β-tubulin III expression and its association with paclitaxel-based treatment response and progression-free survival in ovarian cancer patients. Previous studies demonstrated that high tumoral β-tubulin III expression has been associated with decreased survival with non-small cell lung cancer [60, 61], breast , head and neck  and ovarian cancer . Moreover, a number of studies have also shown that high expression of β-tubulin III is associated with worse treatment response in ovarian cancer [65–67]. Leskela et. al. found that tumors with high levels of β-tubulin III protein have significantly decreased miR-200 expression. They observed the strongest associations with miR-141, miR-429 and miR-200c. miR-200c expression was statistically significantly associated with response to treatment as patients who did not achieve a complete clinical response had lower levels of miR-200c as compared to those showing a complete response. Low expression of miR-200c was also associated with recurrence of ovarian cancer. Moreover, miR-429 expression was found to be significantly associated with recurrence-free survival and overall survival of the patients . The let-7 (lethal-7) family in humans consists of 13 miRNAs located on nine different chromosomes [68, 69]. In multiple human cancers expression of the let-7 family is significantly reduced. Low let-7 expression has been found to be associated with poor survival of cancer patients [70, 71]. Let-7 suppresses multiple ovarian cancer oncogenes, which includes KRAS, HRAS , c-MYC  and HMGA-2 . Moreover, it also inhibits cell cycle regulators such as CDC25, CDK6 as well as Cyclin A, D1, D2 and D3 [74, 75]. The mechanism of down- regulation for let-7 miRNAs is through copy-number alterations . The genomic locus containing let-7a-3/let-7b was deleted in 44% of ovarian cancer samples studied. Restoration of let-7b expression significantly reduced ovarian tumor growth both in vitro and in vivo. Additionally, recent studies have shown a correlation between loss of let-7 and resistance to either chemotherapeutic drugs or radiation [71, 77–79]. Using a drug resistant ovarian cancer cell line, Boyerinas et. al. demonstrated that drug sensitivity to taxanes is increased upon over expression of let-7g as it inhibits IMP-1, an RNA binding protein which stabilizes the mRNA of a number of target genes, including, MDR1 (multidrug resistance-1). MDR1 is a member of the adenosine triphosphate binding cassette transporters (ABC transporter family) which pump drugs across the cell membrane to the extracellular space. Therefore, the expression of let-7g resulted in a decrease in MDR1 and sensitized the cells to Taxane treatment. On the other hand, Lu et. al. observed that ovarian cancer patients responding to a regimen of platinum and paclitaxel had significantly lower let-7a expression than those who did not respond to treatment. Moreover, survival data indicated that patients with high let-7a survived better when they were treated with platinum only (no paclitaxel) as compared to those having low expression of let-7a. The authors conclude that miRNA-let-7a expression can be a potential marker for selection of chemotherapeutic agents in ovarian cancer treatment. Quantitative-RT PCR and in-situ hybridization in a panel of 83 human ovarian cancer samples showed a significant decrease in miR-34a/b/c expression. The decrease was also correlated with the p53 status as p53 regulates the expression of miR-34 family members by promoter methylation and copy number alterations . Over-expression of miR-34 family members reduced migration, invasion and cellular proliferation in ovarian cancer cell lines, providing evidence that the loss of miR-34 family members may be involved in the pathobiology of ovarian cancer. miR-100 is a tumor suppressor which has been found to be down-regulated in most of the ovarian cancer cell lines, especially clear cell ovarian carcinoma cell lines and ovarian cancer tissues [83, 84]. miR-100 represses mTOR (mammalian target of rapamycin) signaling and increases sensitivity to the cancer drug everolimus (rapamycin analog RAD001) in cell lines derived from clear cell carcinomas. mTOR is a serine/threonine kinase and is a downstream effector of the Akt signaling pathway. mTOR has also been shown to be a possible therapeutic target in both cisplatin-sensitive and cisplatin-resistant clear cell ovarian carcinoma . Low miR-100 expression was associated with shorter overall patient survival and advanced stage ovarian cancer. Moreover, its expression has been shown to be an independent predictor of overall survival in ovarian cancer patients. miR-100 also inhibits the expression of the proto-oncogene PLK1 (Polo-like kinase-1) in ovarian cancer . miR-31 is under-expressed in both serous ovarian cancer cell lines and tissues . miRNA-31 inhibits the expression of cell cycle regulators such as E2F2 and STK40, a repressor of p53 mediated transcription, and acts as a tumor suppressor in ovarian cancer. Over expression of miR-31 in ovarian cancer cell lines having non functional p53 pathways lead to decreased proliferation and increased caspase-mediated apoptosis, whereas, over expression of miR-31 had no effect on ovarian cancer cells having wild-type p53 . Thus, miRNA-31 might have therapeutic roles in the case of cancers having p53 mutations. Up-regulation of miR-214 has been detected in various human malignancies, including pancreatic, prostate, gastric, breast and ovarian cancers as well as malignant melanoma [51, 87–90]. miR-214 has extensive roles in chemo-resistance, tumor progression and metastasis [51, 87, 88, 91]. Yang et. al. have shown that miR-214 induces cell survival and cisplatin resistance by targeting PTEN. miRNA microarrays show the aberrant regulation of 36 miRNAs between normal ovarian cells and epithelial ovarian tumors . miR-199a*, miR-214, miR-200a and miR-100 were most highly differentially expressed. miR-199a* and miR-214 were found to be up-regulated in 53 and 56% of the tumor tissues, respectively. miR-214 knockdown was found to abrogate cisplatin resistance in cisplatin-resistant cell line A2780CP, whereas exogenous expression of miR-214 renders cisplatin-sensitive cell line A2780S and OV119 cells resistant to cisplatin induced apoptosis. miR-214 activates the Akt pathway by targeting PTEN, which normally negatively regulates Akt. Constitutive activation of Akt leads to chemo-resistance in different types of tumors including ovarian cancer . Thus, miR-214 possibly plays an important role in cisplatin resistance by targeting the PTEN/Akt pathway. miR-199a and miR-214 have been implicated in the process of differentiation of ovarian cancer stem cells (CSCs) into mature ovarian cancer cells . Twist 1, a transcription factor belonging to basic helix-loop-helix proteins has been shown to regulate the expression of both miR-199a and miR-214 which are part of the human Dnm3os gene. Twist 1 is involved in the differentiation of multiple cell lineages, including muscle, cartilage and osteogenic cells [94–97]. Twist 1 levels increase during the differentiation process leading to an increase in miR-199a and miR-214, a decrease in IKKβ expression (target of miR-199a), and a decrease in PTEN expression (target of miR-214). This eventually results in an increase in the pAkt activity leading to the process of differentiation. miRNA-376c was earlier known as miR-368 and was found to be over expressed in a subset of acute myeloid leukemia . Ye et. al. have shown that miR-376c promotes cell proliferation, survival and spheroid formation in ovarian cancer cells . This is done by suppressing activin receptor-like kinase 7 (ALK7) and its ligand Nodal, which together are able to induce apoptosis in human epithelial ovarian cancer cells. A previous study had demonstrated that the Nodal-ALK7 pathway might be involved in chemosensitivity . miR-376c over expression significantly reduced the effect of cisplatin. Moreover, miR-376c and siRNA inhibitors of Nodal and ALK7 also blocked the effect of carboplatin. Chemosensitive and chemoresistant ovarian tumors showed a differential expression of ALK7 and miR-376c. Immuno-histochemical staining was used to stain tumors with ALK7 and miR-376c was detected using real-time PCR, in patients showing a complete response (CR) and those who had an incomplete response (IR). Patients showing CR showed significant ALK7 staining, whereas the staining intensity was very weak in patients with IR. Additionally, the miR-376c expression level was inversely related to ALK7 in both cases . miRNA-93 is part of the miR-106b-25 cluster . It has been shown to promote tumor growth and angiogenesis by targeting integrin-β8 . In ovarian cancer it is up-regulated in cisplatin-resistant ovarian cancer cells . It regulates cisplatin chemosensitivity in cisplatin resistant ovarian cancer cells OVCAR3 and SKOV3 by targeting the phosphatase PTEN. Over-expression of miR-93 in both these cells increased the ratio of phosphorylated Akt/over the total Akt (pAkt/total Akt). Phospho rylated-Akt has been shown to play an important role in multiple drug resistance including cisplatin [92, 103]. miR-21 is aberrantly expressed and functions as an oncogenic miRNA in many tumors including ovarian cancer [51, 104, 105]. In ovarian cancer cells it promotes cell proliferation, invasion and migration through targeting PTEN . miR-21 also has a role in resistance to hypoxic conditions which inhibit tumor growth . Protein kinase Akt2 induces miR-21 expression under oxygen deprivation leading to suppression of tumor suppressor proteins PTEN, PDCD4 and Sprouty 1 (targets of miR-21). This results in resistance to hypoxia . In addition to the miRNAs discussed above, a number of studies have profiled the miRNA expression of specific subtypes of ovarian cancer. Nam et. al., used a customized miRNA microarray of 314 human miRNAs to analyze the miRNA expression profiles of serous ovarian cancer tissues as compared to normal ovarian tissues . They found differential expression of 23 miRNAs. miR-21 was most frequently up-regulated and miR-125b was most frequently down- regulated (Table-2). Northern blot analysis confirmed the up-regulation of miR-200c, miR-93 and miR-141 and the down-regulation of let-7b, miR-99a and miR-125b. In a separate study, Li et. al. have shown a negative correlation between miR-22 expression and the metastatic potential in serous ovarian cancer cell lines . Additionally, miR-519a was found to be significantly up-regulated in serous and clear cell carcinomas as compared to the mucinous subtype in tissue samples . Higher expression of miR-519a in late stage serous carcinoma showed positive correlation with poor progression-free survival. miR-153 and miR-485-5p were found to be up-regulated in mucinous ovarian carcinoma. The down-regulation of miR-153 and miR-485-5p showed significant correlation with advanced clinical stage FIGO (International Federation of Gynecology and Obstetrics) grade 3 and miR-519a was found to be high in clinical stages III and IV (advanced clinical stages) as compared to stages I and II (early clinical stages) . As mentioned above miR-100 has been shown to be down-regulated in clear cell ovarian carcinoma cell lines and its over-expression in them inhibited mTOR signaling and enhanced sensitivity to rapamycin analog RAD001 (everolimus)  (Table-2). In the same study the authors show the down-regulation of miR-22 and the up-regulation of miR-182 and miR-30a in clear cell ovarian carcinoma cell lines. Over-expression of miR-22 and knockdown of miR-182 could alter the global gene expression pattern of clear cell ovarian cell lines towards a normal state . Previous studies in ovarian carcinoma have shown that miRNAs can be used in its diagnosis as well as prognosis. Lu et. al. demonstrated that patients having low let-7a-3 methylation had overall worse survival than those with high methylation. The miRNA-200 family plays an important role in ovarian cancer and it has been shown that the miR-200 family cluster, which includes miR-200a, miR-200b and miR-429, can predict poor survival when they are expressed at low levels . Yang et. al. showed that miR-214, miR-199* and miR-200a were associated with high-grade and late stage tumors. In an interesting ovarian cancer study  the authors profiled miRNA signatures from tumor-derived exosomes. Levels of 8 miRNAs, which were previously shown to have diagnostic potential (miR-21, 141, 200a, 200c, 200b, 203, 205 and miR-214), were compared in exosomes isolated from serum specimens of women with benign disease and various stages of cancer. The 8 miRNAs had similar expressions between cellular and exosomal miRNAs, with no detection of exosomal miRNAs in control samples. The profile of exosomal miRNAs from ovarian cancer patients was distinctly different from patients with benign disease. HMGA2/let-7 ratio has also been used for prognostic studies . High-mobility group AT-hook 2 (HMGA2), an early embryonic gene is a target of miRNAs let-7a, let-7c and let-7g. Higher HMGA2/let-7 ratio exhibited decreased 5-year progression-free survival (<10%) as compared to a lower ratio (~40%). miRNA therapeutics in ovarian cancer can take different forms. Oncogenic miRNAs can be inhibited by using antisense oligonucleotides, antagomirs, sponges or locked nucleic acid (LNA) constructs . Cancer cells have dysregulation in several miRNAs at the same time and targeting a single miRNA is not sufficient for treatment. Multiple-target anti-miRNA antisense oligodeoxyribonucleotide-MTG-AMO (Multiple target-O-modified antagomirs) are used to inhibit multiple miRNAs at the same time . The expression of tumor suppressor miRNAs can be restored by miRNA replacement therapy. Several miRNAs have been used for this purpose. Use of let-7 miRNA mimetics is a potential tool as intra-tumoral delivery of let-7b has been shown to decrease the tumor burden in lung tumors [116, 117]. The miR-143-145 cluster has been shown to be frequently deleted in cancer. miR-143 and 145, delivered intravenously to subcutaneous and orthotopic xenografts downregulated the oncogenes RREB1 and KRAS . One of the more beneficial miRNA therapies is miR-34 replacement therapy. P53 protein is known to enhance miR-34 expression and it is mutated in many cancers . The intra-tumoral delivery of miR-34 mimics impaired tumorigenesis on a xenograft model of non-small cell lung cancer, and systemic delivery of miR-34 reduced tumor growth of KrasLSL-G12D+ mice [117, 120]. Certain small molecule compounds like enoxacin have been shown to restore downregulated miRNAs to a normal miRNA level or expression pattern without affecting normal cells and with no toxicity in in vivo models [121, 122]. miRNAs can also be used to sensitize tumors to chemotherapy. The efflux of anticancer drugs by ABC transporters is one of the main reasons resistance to chemotherapy drugs develops. miR-9 has been shown to negatively regulate SOX2 which induces the expression of ABC transporters ABCC3 and ABCC6 . Resistance to tamoxifen is restored by the over expression of miR-15 and miR-16. miR-15 and 16 suppress the anti-apoptotic molecule BCL-2 and sensitize the cells to tamoxifen . Similarly, use of antagomirs against miR-21 was found to sensitize cultured cells to the chemotherapeutic agent 5-Fluorouracil (5-FU) . One of the greatest challenges in RNAi therapy continues to be the delivery method of the therapeutic siRNA or miRNA to the target cells. Future focus should be aimed at addressing these issues by engineering an efficient delivery system by use of radiolabeled, tumor specific antibody conjugated nanoformulations to deliver miRNA to the ovarian tumor site. It is very important to formulate an effective delivery method, such as nanotechnology-based delivery approach for microRNA for therapy with the help of strategic image-guided systemic delivery to the tumor. This will be a major contribution in the field of cancer therapeutics and will help overcome challenges in miRNA delivery. The goal of this novel therapeutic approach is to effectively encourage reprogramming of miRNA networks in cancer cells which may lead to a clinically translatable miRNA-based therapy to benefit ovarian cancer patients. In spite of all the above advances there is still a long way to go to understand and apply miRNA therapeutics in cancer and ovarian cancer in particular. Identification of unique patterns of deregulated miRNA expression in ovarian cancer provides valuable information that may: serve as molecular biomarkers for tumor diagnosis; identify low and high risk populations of patients, disease prognosis and prevention of cancer, and predict therapeutic responses. One of the areas of improvement in miRNA therapy has been to reduce or eliminate off-target or non-specific effects. This regulatory network is complex because of the fact that a single miRNA can have multiple targets and several miRNAs can have a single target. Therefore, careful designing of therapeutic strategies is needed to overcome these technical issues. Moreover, the identification of new strategies is required to enhance the potency and stability of therapeutic vectors and the specificity of their delivery to tissues. We hope that with increased understanding of the role of miRNAs in cancer development and by designing more efficient miRNA-modulating molecules, miRNA mediated cancer therapy will give a new impetus to the cure for cancer including ovarian cancer. The authors thank Cathy Christopherson for editorial assistance and Dr. Mohammed Sikander for preparing the figure. This work was partially supported by grants to SCC from Governor’s Cancer 2010, the National Institutes of Health Research Project Grant Program (RO1) (CA142736), and (UO1) (CA162106A) and the Centers of Biomedical Research Excellence (P20 RR024219). The authors declare that there are no financial and non financial competing interests. MSZ designed and drafted the manuscript; MJ, DMM and SK were involved in the critical revision of the manuscript; SCC gave final approval of the version to be published. All authors read and approved the final manuscript.